Bangladesh is no stranger to poverty. Unfortunately the women there are no exception. 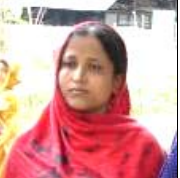 Take Monoara For example: She lives in Bangladesh. She has a small family of just two sons and a daughter. Her husband works earnestly day in and out. But yet He can not earn enough to afford his family with his limited income. Her Husband’s tenacity gives gives Monoara strength, but what can she do with it? The primary aim of this project was to introduce a new way of generating income to women like Monoara and many more. The solution was to introduce low input cage culture technology to poor women beneficiaries in two upazilas (Faridganj and Jhalokathi) of Bangladesh. In total, 35 women were chosen. 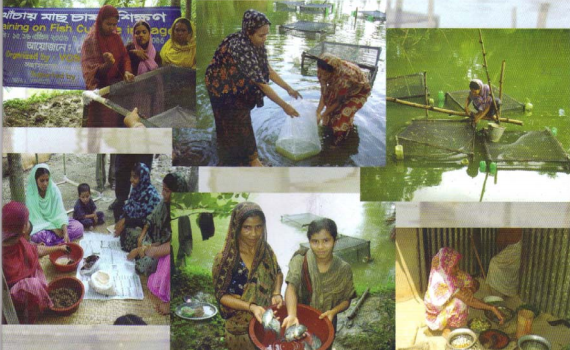 The majority of whom have a pond near their house, most of which are under multiple ownership and used for household work as well as fish culture; however, beneficiaries have no previous experience in cage culture technology. Monoara had just 3 days of training to operate her fish cage set up. Afterwhich she started going to work to help her family, and help her family she did: The total costs of the setup were about 1780TK ($22 USD), the gross sale was 2822.4 ($35 USD) which means the total Net Profit 1032.6 ($13 USD). This Might not sound like much, but in financial terms that’s an Return on Interest of almost 40%! Which is huge. As for Bangladesh food prices… well a single loaf of bread goes for just 13¢ USD. With those profits, that’s 100 Loaves of bread generated by these fish cages. That’s enough to make anyone happy, and Monoara was no exception.